The Oregon Wine Blog: Non-Traditional Wines: Barbera! Welcome to yet another installment of TheOregonWineBlog.com's eight part series; Non-Traditional Wines of the Northwest. In this installment, we look at a very traditional Italian varietal not often seen in the Pacific Northwest; Barbera. As with all of our non-traditional wine articles, we will once again be consulting Wikipedia as an omnipotent source of knowledge. 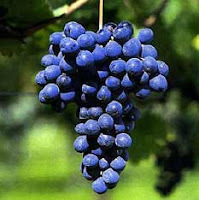 Barbera is currently Italy's third most-produced varietal and is known for being rather easy to grow. While many grapes tend to under-produce without proper attention, Barbera is one that you actually have to prune so nutrients only get to the perfect amount of grapes. Too bad Nebbiolo doesn't suffer from the same problem. In relation to the Pacific Northwest, winemakers are dabbling in testing it out in the Red Mountain, Walla Walla, and Columbia Valley AVAs. Taking into account general Italian geography where this varietal is typically grown, I would expect to see many more AVAs producing Barbera in the near future. The Oregon Wine Blog received two winery-provided samples of Barbera for review (in alphabetical order): Maryhill Winery 2005 Proprietor's Reserve Barbera and Stella Fino 2006 Barbera. This review presented a fascinating dichotomy for us by comparing the same varietal from two distinctly different wineries. The contrast in producers followed through to very different wines. Both wineries produce Columbia Valley wine, but the similarities pretty much end there. Maryhill has been established for 10 years and was recently named Washington Winery of the Year. The 15th largest winery in the state of Washington, Maryhill produces 27 wines from 18 varietals. Stella Fino, on the other hand, is on it's second release and produces small-lot italian only varietals. With 4 wines currently available, they are the classic story of the small winery who's proprietors are pursuing their dream when their day jobs end. Maryhill has been on our radar for a long time, whilst Stella Fino didn't emerge on the scene for the blog until we started research for this series. OK, so on to the wine (yes, that's a pumpkin in the picture)! Maryhill 2005 Proprietor's Reserve Barbera: With a dark burgundy color, this wine had probably the most prominent nose that we have ever experienced. An immediate aroma of leather was almost overpowering, and mixed with the italian earthiness it was somewhat unappealing. Upon tasting the wine, however, the unappealing nature dissipated and we found what we'd describe as a bold raw wine. Meant to be paired with food, it is fruit-forward with a finish of lingering spice. This barbera is 100% estate fruit with 680 cases produced and is priced at $24 per bottle. In a sense we'd describe this wine as a '60's muscle car, stored in the garage and meant to be brought out under the right circumstances. Stella Fino 2006 Barbera: Stella Fino's barbera maintains a lighter ruby color, a bit more on the translucent side. We noticed a prominent aroma of black currant accented by blackberry, combined with the earthy italian nature of the varietal. We found this wine to be more subtle, versatile, and drinkable by itself although it would pair well with food. The dark fruit notes combined with the earthtones created a smooth, fluid wine with a great mouthfeel. At $21 per bottle, you should definitely pick up a bottle as I'm sure there aren't many around. This wine is more like a german performance car, meant to be driven every day and still looking great! So, there you have it...two Columbia Valley Barbera's, both good, very different, and non-traditional in the area. Know of any other Barbera's we should try? Leave a comment! Insatiable red blend from the Columbia Valley has Barbera, along with Cabernet Sauvignon, Syrah and Zinfandel. It's a great smooth blend for under $10 at Safeway. I was first introduced to Barbera this summer when I was in Sonoma. I really enjoyed the varietal, except for the ones that were heavily oaked. I found that the taste and smell of rubber penetrated the Barberas and Zins if they were too oaky- aka Imagery Estate Wines. Cascade Cliffs, just down the hill from Maryhill has the best Barbera I've ever had the pleasure to taste. It's hard to come by from what I've learned since they were out the next time I went by. Fortunately (for me) I joined their club and have 4 bottles waiting for that special occasion. Quinnet in Hood River also has a nice Barbera. The Devil is in the Details: Col Solare!